Started its journey 12 years back, when Saleh Mazed, Chairman of Faiz Foundation had donated his dwelling house in the name of Faiz Foundation Library as well as purchased some books, reading chair-table and two bookshelves for the purposes of creating reading facility to young children of Dhanbila, a remote village of Pabna District. In course of time, now it has been established as a movement for enlightening the rural youths. Like other poorer part of Bangladesh, Chatmohar is a distinctive territory where number of educated persons is 38.06% and almost half of school going children to face poverty by fate. So when the library had come to them as a source of multi learning bibliotheca, they treated it as lighthouse spontaneously. Consequently, with the instructions of Saleh Mazed, we have commenced six specific programs keeping the Batighar as centered. First, a scholarship program has been continuing since 2007 where 41 school going children are getting monthly grants in terms of reading habit and attentiveness. We see these children has grown up with good characteristics as well as hold and spread the spirit of Batighar spontaneously. Second, a program named ‘study-circle’ is ongoing successfully where a reader has to accomplish at least 8 books not related to academic study, in a year. They are encouraged with gifts- a set of new books. Third, a standard size Wall Magazine is managed by its reader. Writers among the readers of Batighar contribute their poems, articles etc. 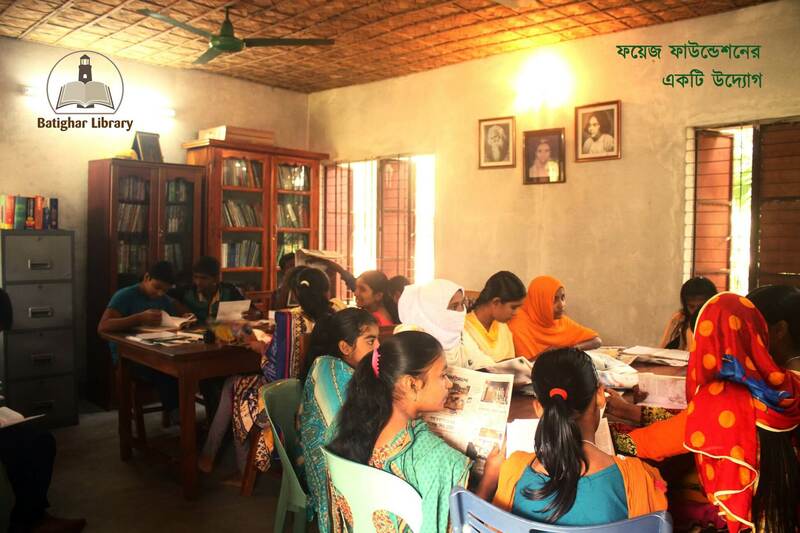 Forth, academy supports program- at least 400 sets of academic books comprises school and college books are given to poor and underprivileged students of Chatmohar, Pabna. Fifth, ‘career support’ is another running program of Batighar, here jobless educated adults find the news of employment easily as well as the needful learning materials since we provide. Sixth, a good numbers of aged and retired persons come here regularly to pass their hours through studying newspapers, magazine and books, they find it as a peace-house. According to our chairman Saleh Mazed, for development of rural library system, having only administrative support is not enough. We also need to realize the value of rural library programs. A high level of awareness about the roles and values of rural libraries is needed in enhancing readers’ learning outcomes, and our supports for the development of collaborative partnerships with rural library stakeholders. Therefore the social workers’ support toward rural library system and library value will contribute to effective rural libraries, influencing the quality of library budget, facilities, learning resources and personal resources.. He loves to see the smiling faces of the children who hold books and that makes him inspired, he said.